This weekend I set my sights on a new destination in Northern Virginia to photograph birds and wildlife. I headed out to Dyke Marsh, just north of Mount Vernon, which is rumored to be one of the best places for bird sightings in the area. Feeling inspired from the friendly Blue Heron from last week, I wanted to see if I could find some similar birds, such as Egrets, out feeding. Low tide was expected at 1:30pm - many birds search the exposed beach during low tide for their next meal. It was a hot weekend so I was sure to pack a small camp stool and plenty of water so that I could setup a mini camp and wait for the birds to arrive. I hiked 3/4s of the way down the trail at Dyke Marsh before finding an area where I could cut to the waters edge. I (thankfully) found a shady spot to setup where I could watch several areas of the marsh at once. I was immediately greeted with two Northern Water Snakes and a few cardinals, which had me optimistic for some great birding. I settled into position and began to wait. After two hours in the blistering heat, my water supplies and patience were running low. I'd seen some ducks and a few fishermen since setting up, but no signs of any of the birds I came to see. With the tide starting to return, I packed my bags. Not every photo trip is a success - I've come to accept that there are plenty of days where I may return with nothing to show for my efforts. Even still, I love going out in search of the next great moment I'll share with nature. As I started the hike back to the car I heard an unusual sound. It was clearly a bird chirp, but it didn't sound like the other birds. It was too high pitch. I identified the source of the high pitched chirping a moment later coming from a small birds nest high in a tree. Birds nests have always posed a challenge to photograph - they are usually too high in a tree with too many leaves around to get a good angle to photograph. This nest, however, was clearly visible from the ground with minimal obstruction. I decided to setup my camera with the hope that one of the baby birds would pop it's head out from the nest. 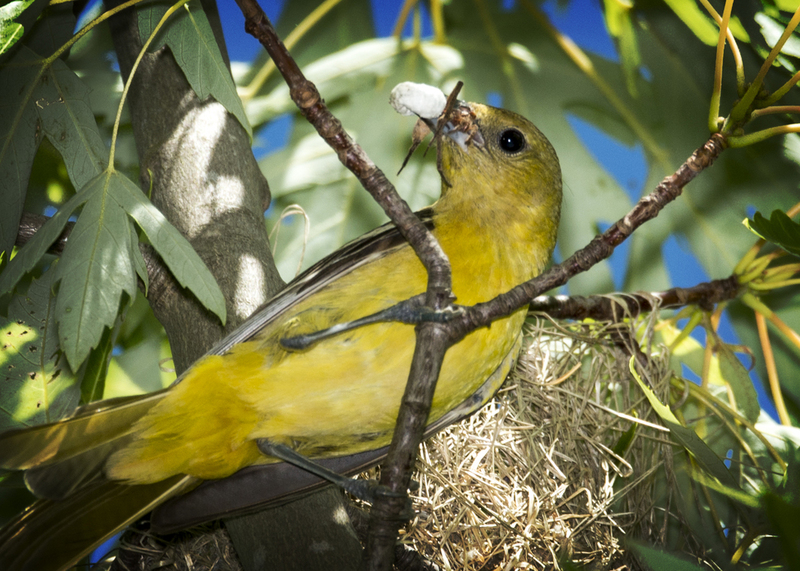 No sooner am I setup than I see a bright yellow Orchard Oriole sitting in the tree just below the nest. She was holding an insect in her mouth and watching my every movement. I fired off a series of photos. Despite my big flash, she must have decided I didn't pose a threat and began feeding her young. 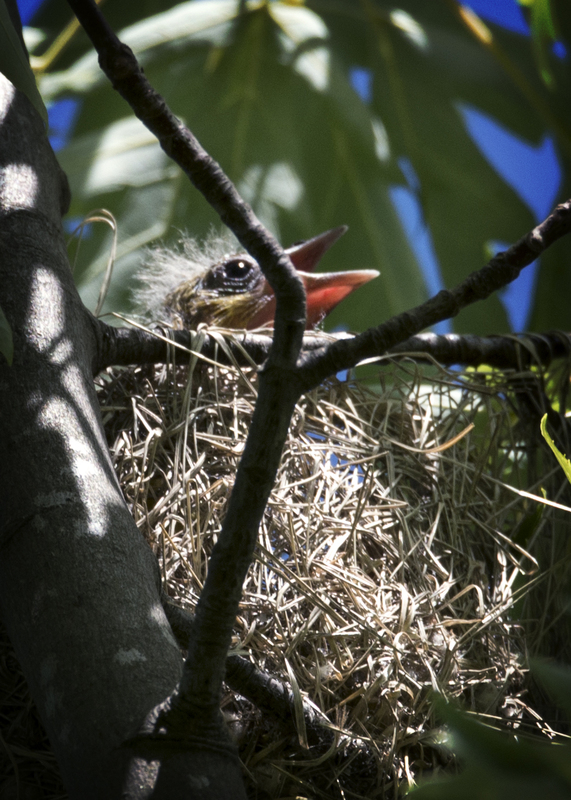 The pink beaks of the birds were barely visible poking out from the top of the nest. I was thrilled. Seeing, much less photographing, a mom feeding her young is a bucket list item for most photographers. I wasn't prepared for the possibility that it'd continue to happen. For the next hour I sat and watched as the male and female Orchard Oriole took turns coming to the nest every five minutes to deliver more insects to the young birds. I got several great shots, but narrowed it down to these three to tell the story. Shot with Nikon D800, Nikon 80-400mm lens, Nikon SB-700 flash with Better Beamer, Gitzo tripod. The female Orchard Oriole scoping me out. She was just bringing some new insects to the nest. The young birds would cry out for their parents after they left the nest in search of more bugs. They looked so incredibly frail, yet packed a loud chirp! 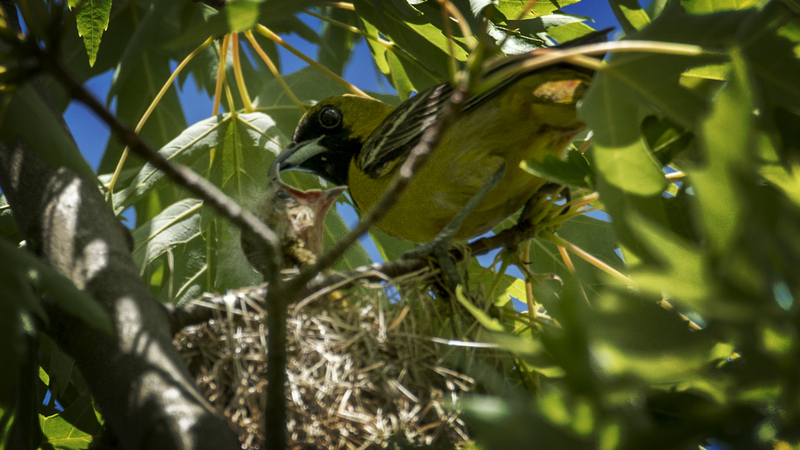 The male Orchard Oriole delivering some fresh insects to his young. There were at least two babies in this nest.